Start off your visit on the 2nd (Sun): take in panoramic vistas at Eiffel Tower, then contemplate the long history of Arc de Triomphe, and then explore the world behind art at Louvre Museum. 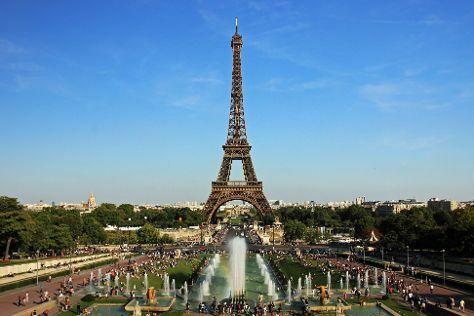 To see traveler tips, reviews, more things to do, and more tourist information, go to the Paris trip builder site . If you are flying in from United States, the closest major airports are Paris-Orly Airport, Charles de Gaulle International Airport and Paris Beauvais Tillé Airport. In June, daily temperatures in Paris can reach 74°F, while at night they dip to 55°F. On the 4th (Tue), you're off toLucerne. Kick off your visit on the 4th (Tue): get great views at The Nine Towers, then look and learn at Swiss Museum of Transport, and then take in the awesome beauty at Mt Pilatus. Get ready for a full day of sightseeing on the next day: pause for some photo ops at Lion Monument, explore the activities along Lake Lucerne, then tour the pleasant surroundings at Ufschotti Park, and finally take in the views from Chapel Bridge. For reviews, ratings, maps, and tourist information, read Lucerne trip builder app . Do a combination of flight, bus, and train from Paris to Lucerne in 4.5 hours. Alternatively, you can do a combination of flight and train; or drive. June in Lucerne sees daily highs of 74°F and lows of 56°F at night. Cap off your sightseeing on the 6th (Thu) early enough to go by car to Interlaken. On the 6th (Thu), get your game on at Seilpark Interlaken and then fly like a bird with a parasailing or paragliding tour. Plan a trip to Interlaken easily and quickly by telling Inspirock to suggest an itinerary. Getting from Lucerne to Interlaken by car takes about an hour. Other options: take a train. June in Interlaken sees daily highs of 72°F and lows of 53°F at night. Wrap up your sightseeing on the 6th (Thu) early enough to take a train to Florence. Start off your visit on the 7th (Fri): get to know the fascinating history of Piazza del Duomo, contemplate in the serene atmosphere at Cathedral of Santa Maria del Fiore, admire the masterpieces at Uffizi Galleries, then snap pictures at Ponte Vecchio, and finally see the interesting displays at Galleria dell'Accademia. Keep things going the next day: take in panoramic vistas at Campanile di Giotto, then examine the collection at Pitti Palace, then take some stellar pictures from Piazzale Michelangelo, and finally take in nature's colorful creations at The Boboli Gardens. To find traveler tips, maps, ratings, and more tourist information, use the Florence holiday maker . Take a train from Interlaken to Florence in 6.5 hours. Alternatively, you can do a combination of train and flight; or drive. Traveling from Interlaken in June, expect Florence to be a bit warmer, temps between 83°F and 65°F. Finish your sightseeing early on the 8th (Sat) to allow enough time to take a train to Pisa. 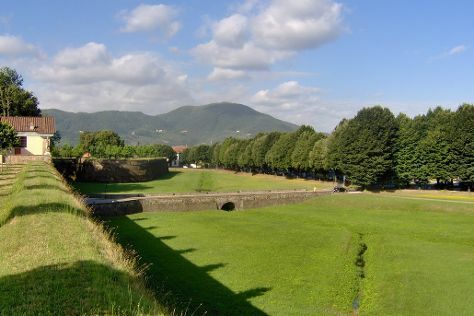 Start off your visit on the 9th (Sun): admire the striking features of St Martin Cathedral, steep yourself in history at Le mura di Lucca, then contemplate in the serene atmosphere at Basilica of San Frediano, and finally take in panoramic vistas at Torre di Pisa. For other places to visit, traveler tips, reviews, and more tourist information, read Pisa trip builder tool . Getting from Florence to Pisa by train takes about an hour. Other options: drive; or take a bus. Traveling from Florence in June, Pisa is slightly colder at night with lows of 60°F. Finish up your sightseeing early on the 9th (Sun) so you can travel to Rome. Start off your visit on the 10th (Mon): admire the landmark architecture of Pantheon, ponder the design of Trevi Fountain, then explore the ancient world of Palatine Hill, then take in the architecture and atmosphere at St. Clement Basilica, and finally explore the ancient world of Colosseum. On the 11th (Tue), you'll have a packed day of sightseeing: explore the world behind art at Galleria Borghese, contemplate the long history of Roman Forum, then make a trip to Piazza Navona, and finally make a trip to Spanish Steps. To see where to stay, ratings, reviews, and tourist information, use the Rome trip tool . You can fly from Pisa to Rome in 3 hours. Alternatively, you can take a train; or drive. June in Rome sees daily highs of 84°F and lows of 65°F at night. Wrap up your sightseeing on the 11th (Tue) early enough to drive to Vatican City. Covering 44 hectares (110 acres) in the city center of Rome, the wall-enclosed sovereign state of Vatican City is one of the most famous religious sites worldwide, serving as the papal residence and home of the Roman Catholic church. Start off your visit on the 12th (Wed): explore the world behind art at Vatican Museums, don't miss a visit to Cupola di San Pietro, then appreciate the history behind La Pieta, and finally don't miss a visit to St. Peter's Basilica. To find where to stay, other places to visit, ratings, and tourist information, you can read our Vatican City trip itinerary maker tool . Vatican City is just a stone's throw from Rome. Expect a daytime high around 84°F in June, and nighttime lows around 65°F. Finish your sightseeing early on the 12th (Wed) so you can travel back home.